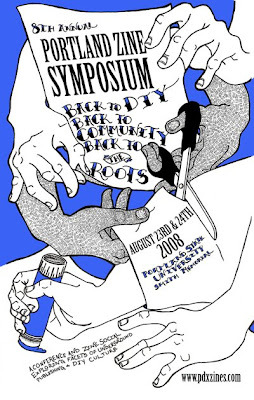 Ponyboy Press - zine maker, design lover, dedicated homebody: Portland Zine Symposium year 7! It is hard to believe that it is already year 7 of the Portland Zine Symposium! I attended the first one in 2001 and have participated ever since. I just reserved my table and now I only need to finally finish up Current Resident, make a whole new issue of Figure 8 (this one is going to have a little twist to it!) and copy lots of old zines - all in 2.5 months! Yipes. The dates this year are August 23rd and 24th. You can find out more here. I hope you can come!